Kellogg Community College will host an exhibit of works by California mixed-media artist Philip Carey beginning this month. 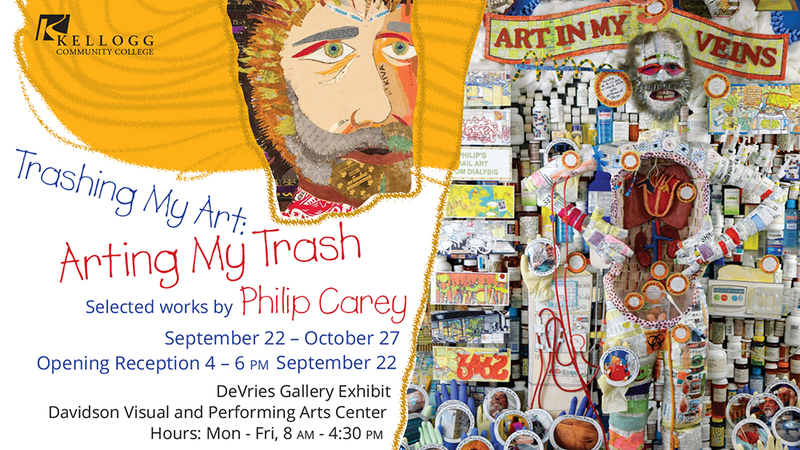 The exhibit, titled “Trashing My Art: Arting My Trash,” will run from Sept. 22 through Oct. 27 in the Eleanor R. and Robert A. DeVries Gallery in KCC’s Davidson Visual and Performing Arts Center, on campus at 450 North Ave., Battle Creek. The exhibit is free and open to the public for viewing during regular gallery hours, which are 8 a.m. to 4:30 p.m. Mondays through Fridays. An opening reception, which is also free and open to the public, will be held from 4 to 6 p.m. Thursday, Sept. 22. At 5 p.m. Carey will present an informal artist talk in the gallery. At the artist’s request, refreshments related to the artwork will be served. Carey’s exhibit will include collage and sculptural installations created using nontraditional materials such as illustrated business envelopes, 3- by 5-inch Post-it notes, and bandages used during kidney dialysis treatments related to a successful kidney transplant, which serves as inspiration for many of the works in the exhibit. Carey is an award-winning artist who has exhibited in museums and art centers throughout the United States. A veteran of the U.S. Navy, Carey earned a bachelor’s degree in Exhibit Design from California State University Long Beach and worked a 40-year career that included designing, installing and curating exhibits for organizations across the country. For more information about Philip Carey, visit his website at www.strangeartofphilipcarey.com. For more information about the exhibit or other arts initiatives at KCC, contact the College’s Arts and Communications office at 269-965-4126.